There’s nothing better than a nicely grilled or roasted meat— whether it is pork, beef, or chicken. As its aroma hits you, you just can’t resist drooling over while it cooks. The excitement you feel as you slice its tender meat and the juiciness just oozes out. And as you bite, the flavors just burst into your mouth giving you a feeling of satisfaction. THANK GOD FOR A JUICY PIECE OF HEAVEN ON EARTH! But, nothing disappoints me more than a dry, tasteless chunk of meat that looks boring to the eyes. And I know you feel the same since you got lost in here. Now, if you want a restaurant-quality meat with oozing juiciness and bursting flavors, then you need to level up your marinating technique. And I’m not talking about the traditional “48-hours-submerged” marinade, I’m talking about injecting it directly into the meat for a 100% flavor. Marinating, Brining, and Injecting: What makes them different from each other? Meat Injectors: What’s so good about them? How to Use a Meat Injector? Hearing the word “injectors” you might think that these tools were taken from a doctor’s office, but I promise you that these nifty tools belonged to your kitchen. A meat injector is an ingenious device that allows you to prepare mouthwatering, flavorful and tender meat. It is a big syringe (not for injecting humans with drugs) with a special kind of needle for infusing seasonings and marinade into your meat (not YOUR meat, though) in order to bring out the tastiest meat to grace your palate. We all know this process. It is the most common process of preparing meat for grilling or roasting. Marinating is the process of soaking meat pieces in a specially made liquid seasoning. Usually, the pieces of meat are cut to smaller sizes in order to absorb the flavor even better. However, this process can take a while (probably even days) for the flavor to truly merge with the meat. Bigger pieces of meat are harder to marinate since they might produce an uneven flavor. Its surface is the only thing soaked in the seasoning, and the middle will stay bland. For storing marinated meats, it requires a glass or plastic container since metal reacts with acids. And it needs to be refrigerated otherwise it will be spoiled. Popularly used for poultry meats, brining is a process where a whole turkey or chicken is submerged in a container or plastic bucket filled with marinade or brine and is left like that until the meat finally absorbs the flavor. This process needs a lot of marinade, time and takes large space inside the fridge in order to keep it away from bacteria and prevent it from spoiling. However, even submerging a whole meat does not guarantee that the flavors will reach all the way to the bones on thicker meat parts. Injecting is for all types of meat. This is the fastest and most practical way to add flavors all the deepest part. You simply use the best meat injector and inject the marinade or seasoning into the meat. That’s it! Having a meat injector at your disposal offers you a number of benefits you can enjoy. The 2 primary benefits that you can experience with the best meat injector are effective marinating and adding moisture to any kind of meat. Traditional methods of marinating like brining and rubbing spices into meats only sits on the meat’s surface. After few days, the spices and flavors can probably enter the meat, however, it does not get to the deepest part. This simply means that your meat will only be flavorful on the outside, but taste bland on the inside. Now, meat injectors, allows you to penetrate the meat’s surface with special needles and inject flavorings into the meat. Thus, a sure way to get juiciness and flavor deep down. It is also the only way to get spices, herbs, fats, and other large molecules deep to the meat. Also, the liquid injected can help make the meat moist during the cooking process. Because meat injectors help add moisture to every type of meat, you can effectively cook large slabs of meat on high heat temperatures and still be perfectly succulent inside. Moreover, marination and brining take quite a lot of time before the flavors seep in. You will need 30 minutes of soaking time in order for the flavors to stick to the meat. Meat injectors, on the other hand, guarantee that the meat will have all the flavors of your marinade in mere seconds. You have less waste, no large containers required, and no refrigerator space problems. Meat injectors are very easy and simple to use. First, decide on what kind of seasoning or marinade you want to inject into your meat. Second, fill the meat injector with the marinade of a liquid mixture of your choice by drawing it into the chambers with the needle. Third, stick the needle to the meat and push the other end in order to release the flavor or liquid mixture into the meat. In any case, a meat injector is not a kitchen appliance that needs a degree in culinary or extensive culinary knowledge or training. Aside from adding flavors to the deepest parts of any meat, enhancing its flavor and moisture, a meat injector is not only limited to meats but can also be used to other types of foods. Meat injectors can be creatively used in fruits. Using meat injectors, you can infuse liquor, chocolate and pretty much anything you want to fruits. You can also infuse vanilla or chocolate to baked goods for a wonderful treat and even add yogurts to meringues. The bottom line is, uses of meat injectors are practically endless. As long as you want additional flavors or liquid ingredients inside foods, then a meat injector will do the job for you. A meat injector is not a complicated kitchen tool, however, when buying the best meat injector, there are some variations and important key factors you need to consider. Most meat injectors are made of plastic or stainless steel. Whatever you choose, make sure that you take a meat injector that has food-grade material so it does not react with your marinades ingredients. Next, you need to be mindful of its size and capacity. If often prepare large cuts of meat, then you would want a meat injector with large capacities so that you do not have to refill multiple times. The standard size of meat injectors is 2 oz., however, there are also larger meat injectors for commercial use. Meat injectors are very easy to use, however, you need to take care of them. Keep in mind that meat injectors deal with oils and raw meats. It has small crevices that can harbor bacteria. Look for a meat injector that can be taken apart easily. Also, you might need some specialized brushes in order to reach narrow spaces. 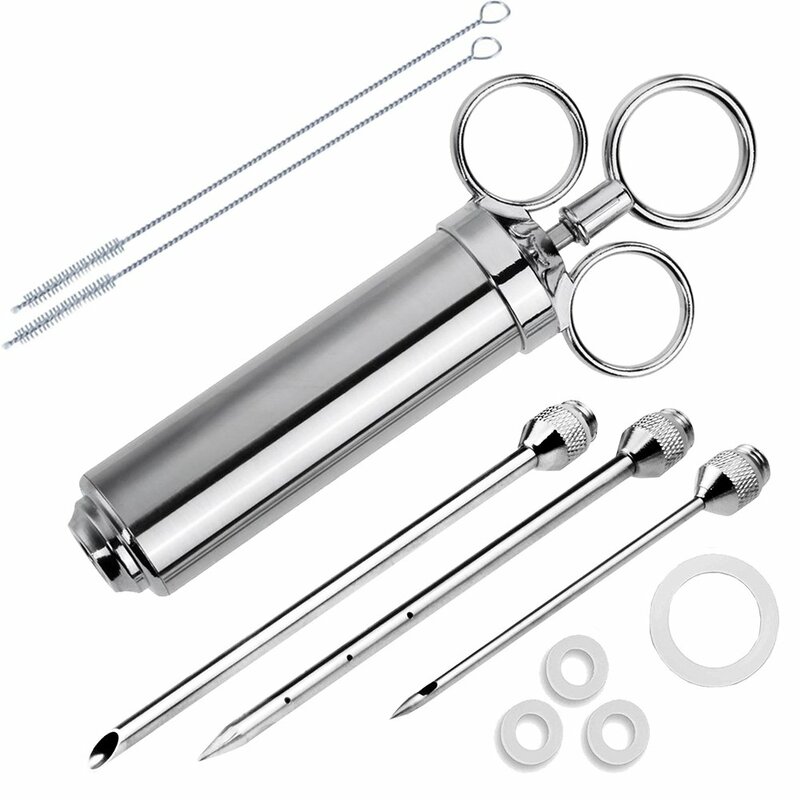 When looking for meat injectors, you will notice that it comes with different sized needles. The needle type you want, of course, depends on the marinade type that you use. Thin needles are great when using pure liquid marinades. Wider or larger needles, on the other hand, is suitable for marinades with little chunks of spices and herbs in it. However, keep in mind that larger needles make it harder to penetrate the meat. There are meat injectors that come as kits which offers you a variety of needle types with different styles and lengths. This would be a great option if you are one of those people who loves grilling or roasting meats. 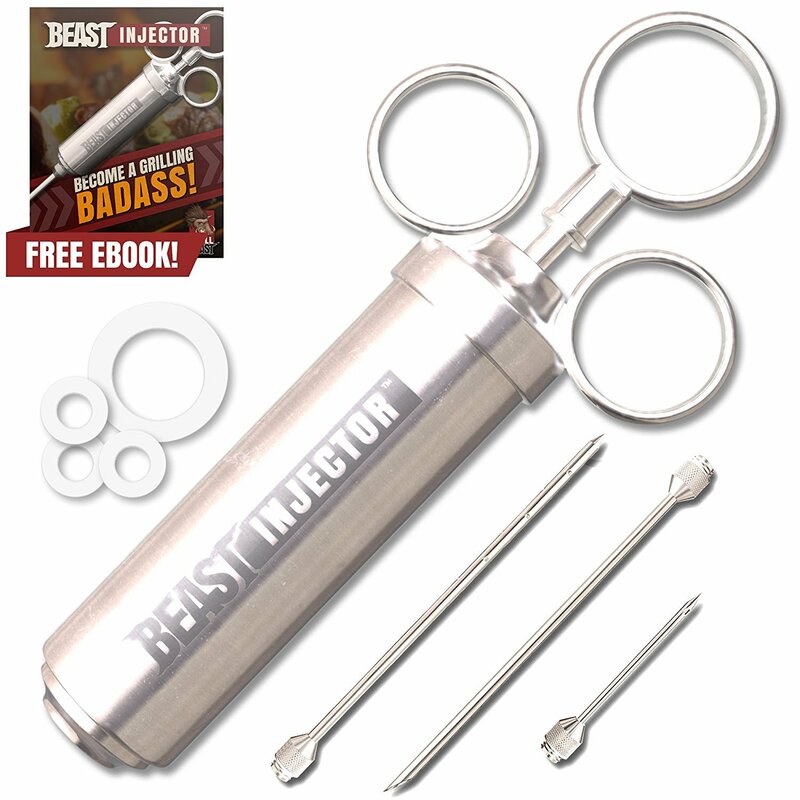 This stainless steel meat injector from Grill Beast feels quite good on your hand. It is not too heavy making it easy and practical to use. The needles and syringe are all made of food-grade stainless steel, however, the screw cap and handle are not. This injection kit features 3 needles: a 6-inches long needle with wide tip for chunky marinades, another 6-inches long needle with 12-holes, and a 3-inches thin needle. It also comes with a 2-ounce chamber which you can use to add marinades effortlessly to small or large cuts of meats. This meat injector is dishwasher-safe for easy cleaning. In any case that you were not satisfied with this product, it offers a money-back guarantee and a lifetime manufacturer guarantee for easy returning. Made of 304 food-grade heavy duty stainless steel, this meat injector from JY Outdoor is guaranteed durable and comes with sharp needles that can puncture even the toughest or thickest slabs of meat. It has an ergonomic handle for comfortable grip and pressure control. This meat injector kit comes with a 2-oz injector barrel, 3 professional marinade needles, a piece of large spare syringe silicone, 3 pieces of small spare silicone O-rings, 2 pieces of needle cleaning brushes and an instruction manual. It is designed for quick and easy disassembling. It is dishwasher safe and comes with 2 cleaning brushes, one small and one big, for super easy cleaning. 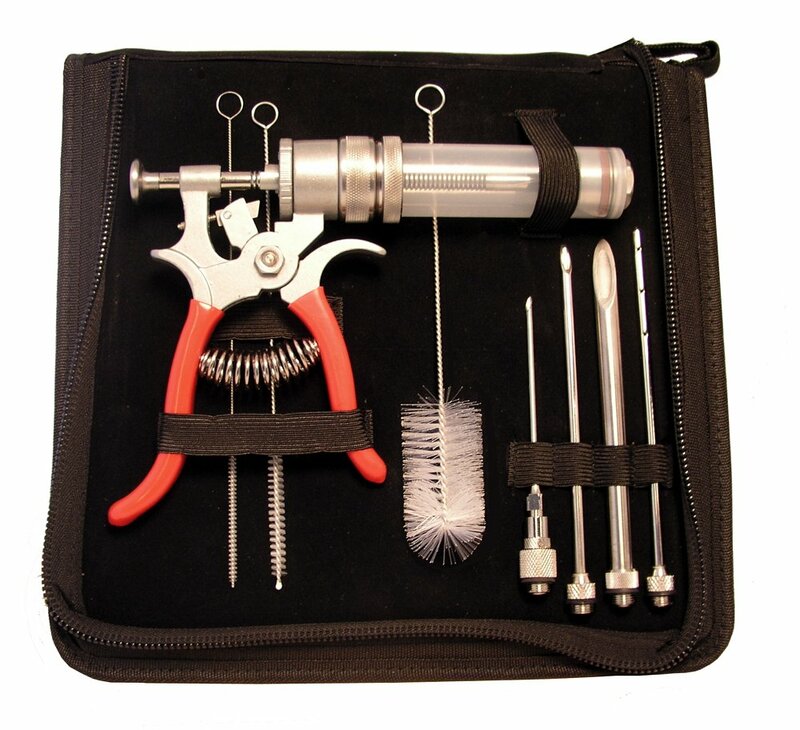 Lastly, JY Outdoor offers a Lifetime Warranty and a 100% money back guarantee so you can order this meat injector kit with confidence. 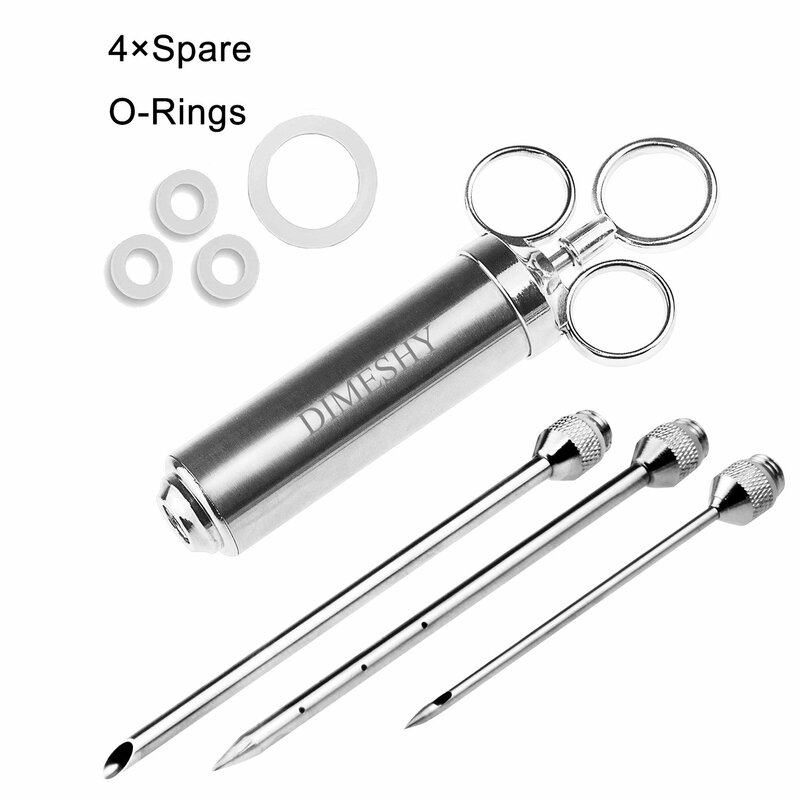 This Heavy Duty Meat Injector from Dimeshy is made of 304 food-grade stainless steel that is FDA-approved and comes with 3 ring handle for a better, comfortable grip. It is safe and healthy that guarantees no bending, breaking, or corroding. This Meat injector comes with 3 types of seasoning needles: one short needle for chicken meats; one with large holes for marinades with minced garlic, onions and other herbs and spices; and one with side holes suitable for liquid marinades. It has a sturdy construction that lets you marinate any type of meats, soft or tough slabs, Dimeshy’s meat injector will surely penetrate for a juicy and flavorful meat. It is very easy to disassemble and is dishwasher-safe. Don’t worry about buying, in case you are not satisfied with it, Dimeshy offers a 100% money back guarantee and 12-months warranty. This meat injector is not like the others. That goes with its feature and price. In fact, this one costs more than all the other injectors together. Although overpriced, I simply can’t deny that this meat injector from SpitJack is fun and quite easy to use. It requires little effort to inject marinade into the meat and you finish real quick. It literally looks like a gun, so you just poke and squeeze it and you’re done. You can also adjust the amount and flow of marinade that you want to insert. This kit is completely equipped with 4 needle types: a small thinned needle for small pieces of meat, a needle with an over-sized opening for larger chunks, a long needle for deeper penetration and one with numerous hole. It comes with 3 custom cleaning brush as well. This meat injector may look really hard to clean, but it is surprisingly easy to clean. It even comes with a one-year warranty in case something happens or it has defects. OdoWalker offers a different innovation to their meat injector. It comes with a meat tenderizer gadget that allows you to tenderize the meat and inject marinade at the same time. Such preparation ensures cooking efficiency and great improvements in the meat’s taste and tenderness. This meat injector + meat tenderizer is made of high-quality plastic and durable 304 stainless steel that you can use for generations. All of its materials are made of 100% food safe material so it is healthy and safe to use. Perfect for any types of meat whether its fish, turkey, chicken, lamb, beef or pork. Make any tough meats surrender and experience a “melt-in-the-mouth” tenderness that you will surely love with this Meat Flavor Injector and tenderizer in one! I hereby crown SPITJACK Magnum Meat Injector Gun as the King of all meat injectors. Its unique and helpful design really make it different than the other meat injectors and makes marinating fun and easy. Also, it has an overwhelming tag price fit for a king. Now, for average cooks who prioritize budget first (like myself), the GRILL BEAST Stainless Steel Meat Injector Kit is a fine choice. It is really affordable for all its amazing features. Plus, it offers a risk-free purchase with a lifetime warranty and 100% money back guarantee so you don’t need to worry if things don’t just workout. For meat lovers, flavors and juiciness matter. Meat injectors make sure that such requirements are accomplished so that you and your family can enjoy world-class meat at home. And there you have it guys! I hope this article has been really helpful on your journey for tastier meats. If you have any questions or secrets you want to share, feel free to leave a comment below. Until then, Happy Infusing! !